Csarda shouldn't be missed out. 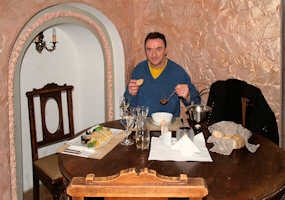 Hidden on a peaceful side street of the Old Town we found this charming restaurant in Vilnius to be a real gem. 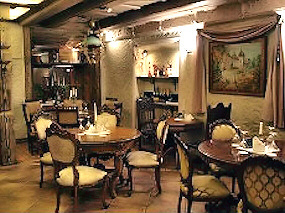 The interior, which is reminiscent of a hundred years old Hungarian restaurant, provides a romantic setting for sampling some of the most delicious food that we have tried in Vilnius. John and I immediately fell in love with this intimate, yet relaxed place and were impressed by its deco of splendid wooden furniture, vaulted ceiling, old paintings representing some history of Hungary, collections of old fashioned cigars and some other antiques. As the main dining room seemed quite busy with people, we chose to sit at a spacious round table in a smaller cosy room close to the bar. I loved the violin tunes which were playing in the background and perfectly added to the atmosphere. The look and feel of the restaurant set high expectations for the food which we were eagerly awaiting. The executive chef from Budapest ensures authenticity and quality of the Hungarian food. The menu offers Hungarian goulash, lamb steaks, goose pates, a variety of soups, salads and authentic deserts. They also have a variety of fish and seafood dishes made according to the Hungarian recipes. I went for mussels with Hungarian noodles served in a light creamy white wine sauce (7 €). The meal was cooked to perfection with mussels so tender and juicy that I had only tried in Greece. 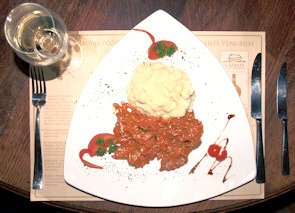 John enjoyed his tenderly cooked Beef stew “Hentes” at 9 €, which arrived creatively presented. The Hungarian goulash soup “Szalon” 4 €, was flavoursome and came in a pot resting on a little stand with a lit candle inside to keep it warm. John ordered a pleasant house wine at 7 € to accompany our meal. It’s worth mentioning that the restaurant takes pride in more than 40 different kinds of Hungarian wine offered on the menu. For desert we had tasty traditional curd balls at 3 € with cream sauce and coffee. All in all we highly recommend this restaurant which we consider serves some of the most delicious food in town, providing very attentive service and delightful ambiance. Exceptional value for money.